Spinal center: This is the collection of nerve cells in the intermediolateral column if spinal cord extending from T1–L2 (may be L3) segments. These cells are called connector neurons. Effector neuron: These neurons are situated outside central nervous system (spinal cord) which receive synaptic connection from axons of connector neuron. The synaptic connection with cell bodies of effector neurons from knoblike structures, paravertebral in position, called sympathetic ganglia, situated in vertical row. The ganglia are connected by chain of nerve fibers called sympathetic trunk (sympathetic chain). Smooth muscle fiber of: a) Different viscera, b) Wall of blood vessels, and c) Root of hair follicles – Arrectores pili. Supraspinal center: Nuclei of posterior half of hypothalamus which influence spinal center through hypothalamospinal tract. Sympathetic efferent outflow going to end in target organs anywhere in the body possess the center which is limited in intermediolateral cell column of spinal gray matter from T1–L2 (may be L3) segment of spinal cord. All sympathetic efferent outflow finally to end in target organs come out as branches of sympathetic ganglia. Branches of sympathetic ganglia are of two types Lateral branches and Medial branches. Axons of sympathetic connector neurons come out through spinal nerve. The fibers are myelinated. Close to midline, and adjacent to vertebral column, these fibers leave spinal nerve and join the sympathetic ganglia as preganglionic fibers. As these fibers are myelinated, they are white in color for lipid content of myelin sheath. That is why they are called white rami communicantis. As white rami, the preganglionic fibers relay in sympathetic ganglia. Postganglionic fibers, which are nonmyelinated leave the sympathetic ganglia to rejoin spinal nerve, are called gray rami communicantis. The gray rami communicantis, rejoining spinal nerve are the lateral branches of sympathetic ganglia. Peripheral blood vessels (smooth muscles of tunica media). Some of the axons of connector neurons from sympathetic center, passing through white rami communicantis to sympathetic ganglia, do not relay. So these fibers do not rejoin spinal nerve through gray rami. These fibers come out as medial branches of sympathetic ganglia, still as preganglionic fibers. They are known as splanchnic branches. These medial branches of sympathetic ganglia take a long course to reach the central or proximal arteries of trunk where they relay in second order of (excitor) neurons. The ganglia formed here are homologous to sympathetic ganglia and are named according to the name of the arteries to which they are related, e.g. celiac ganglia, aorticorenal ganglia. These ganglia, along with network of nerves form autonomic plexus from where postganglionic sympathetic nerves follow the branch arteries to reach wall of viscera. 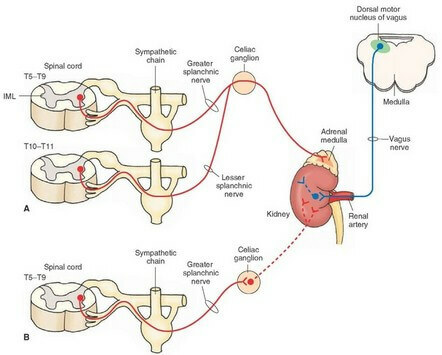 At this stage, it is important to note that, some of the medial branches of sympathetic ganglia come out as postganglionic fibers to reach the target organ. Sympathetic and Parasympathetic – How One Differs from the Other?